Vanessa Hudgens was spotted leaving Nine Zero One Salon yesterday wearing a Faithfull the Brand Montreal Knit Top ($69.50), Mm6 By Maison Margiela Mid Rise Wide Leg Trousers ($465.00), Vera Wang Iona Sunglasses ($405.00), a Gucci GG Supreme Tote Bag ($1,750.00 – wrong print), a Gucci GG Logo Belt ($420.00) and Ancient Greek Apteros Snake Slides (€235.00). You can find similar pants for less at Princess Polly ($65.00). Lucy Hale was spotted out and about in Los Angeles wearing the Aqua Lace-up Rib Knit Bodysuit (Sold Out), Paige Hoxton Ankle Ultra Skinny Jeans ($199.00), Vera Wang Aviator Sunglasses ($405.00), the Alison Lou Large Bashful Gold with Pink Sapphires ($1,595.00), a Céline Belt Bag (Not available online), and Freda Salvador x Anndra Neen Keen Mules ($385.00). On the first day of Weekend 1 at Coachella Valley Music and Arts Festival, Vanessa posted a photo on instagram wearing a Same Swim The Foxy Top ($160.00) and The Heart Breaker High Rise Bottoms ($120.00), with a Forever 21 Translucent Visor ($9.90) in Yellow and Chanel CC Pearl Necklace (not available online). Later that day, Vanessa changed into a For Love & Lemons Barcelona Bikini Top (sold out), a Camilla Front Tie Cape (not available), a pair of Forever 21 High-Waisted Lace-Up Shorts (sold out), a Forever 21 Western Belt (sold out), a Lack Of Color Jethro Hat ($89.00), some Vera Wang Round Frame Sunglasses ($405.00) and her leather fringe boots similar to the Journee Collection Viv Western Booties ($39.95). You can get the look with a Forever 21 Scalloped Lace Bralette ($10.90), Charlotte Russe Refuge Hi-Rise Lace Up Denim Shorts ($21.59), NY&C Western Belt ($15.00), Spitfire Round Sunglasses ($27.30) and a Roxy Little Ma Fedora Hat ($14.99). 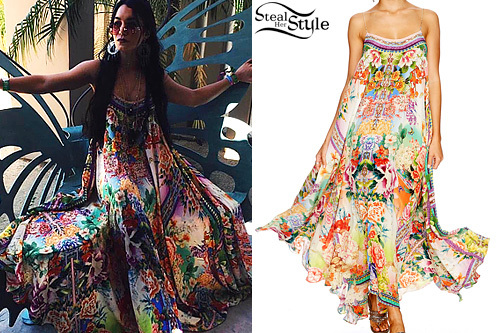 Vanessa’s next outfit was this Camilla Flower Hour Full Hem Long Dress ($700.00). 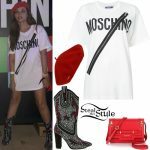 Later on Day 2, Vanessa changed into a We Koko Disco Top ($171.26), a pair of Derek Lam 10 Crosby Leather Detail High Waist Army Shorts (sold out), the Via Spiga Franka Boots ($37.99+) and a Chanel Quilted Backpack (not available online). You can get the look for less with Volcom Dittybopper Shorts ($34.99), Billabong Sandz Boots ($40.00) and a Mango Quilted Duffle Backpack ($22.00). Zoë Kravitz attended the premiere of the upcoming HBO series Big Little Lies wearing a Vera Wang Spring 2017 Dress (Not available online), a Moynat Mini-Vanity Bag (Price upon request), Mia Earrings ($21,700.00 – similar style), Simplicity Earrings (Not available online) and a Mirian Ring ($15,600.00) all by Ana Khouri, with Sophia Webster Rosalind Crystal-Heel Satin Sandals ($495.00). You can find similar sandals for less at Lasula ($18.00). Sarah Hyland arrived at The 22nd Annual Critics’ Choice Awards wearing a Vera Wang Spring 2017 Dress (Not available online), Lorraine Schwartz Necklace (Not available online) and Giuseppe Zanotti Swarovski Satin Sandals ($775.00 – similar style). You can find similar sandals for less at Zappos ($79.95). Sarah Hyland posed at the HFPA & InStyle Golden Globe Awards 2016 Celebration wearing a Vera Wang Spring 2016 Dress (Not available online), Neil Lane 2 ct tw Diamonds 14K White Gold Earrings ($5,999.99) and a pair Stuart Weitzman Nudist Sandals ($398.00). You can find similar sandals at Boohoo ($40.00). Kendall Jenner was spotted arriving at a yacht in the Sydney Harbor yesterday wearing a Kendall&Kylie Mesh Insert Bodysuit ($79.99) and the Kylie Lace Up Pencil Skirt ($129.99) both by Forever New, a Forever 21 Contemporary Life in Progress Open-Front Trench Coat ($47.90) and a pair of Vera Wang Spring 2016 Boots (Not available online). Rita Ora was spotted leaving her hotel in New York yesterday wearing a High Risk T-Shirt by Enfants Riches Déprimés ($435.00), Levi’s Vintage Jeans ($189.00), her Harley Davidson Vintage Leather Hat (Not available online), Tom Ford Anoushka Cat Eye Sunglasses ($435.00) and a pair of Vera Wang Fall 2015 Boots (not available online). You can find similar jeans at H&M ($20.00), similar sunglasses at Forever 21 ($7.90) and lug sole platform boots at GoJane ($24.16). Rita Ora appeared on Good Morning America today to promote her new single “Body On Me” wearing a Alexander Wang Studded Silk & Cashmere Turtleneck Sweater ($850.00), Alexander Wang Cottonwool High Waist Pants ($695.00), Vera Wang Fall 2015 Boots (not available online), and Tom Ford Anoushka Cat Eye Sunglasses ($435.00). Get the look for less with a black turtleneck from Karen Scott ($10.98), cropped wide-leg trousers from Old Navy ($34.94), lug sole platform boots from H&M ($34.99), and cat eye sunglasses from Lulu’s ($12.00).